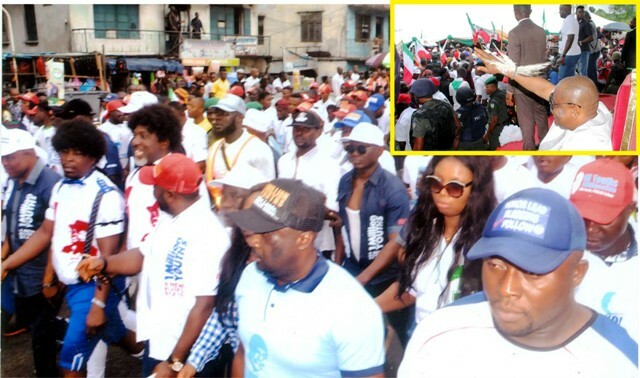 Rivers State youths participating at the one million-man march in support of Governor Nyesom Wike for second term in Port Harcourt, last Thursdaay. Inset: Governor Nyesom Wike acknowledging cheers from the crowd, during a mega rally in Ahoada, recently. Rivers State Governor, Chief Nyesom Wike has stated that the consistency with which the police sabotages the electoral process in Rivers State amounts to a declaration of war on the people. In a state broadcast yesterday on the failed Port Harcourt State Constituency 3 bye-election disrupted by the police and armed APC thugs, Governor Wike charged Rivers people not to succumb to the antics of the police, lest they become slaves in their fatherland. “Clearly, there are dangerous times ahead but we must not give in to intimidation lest we lose our liberties and become slaves in our own land. 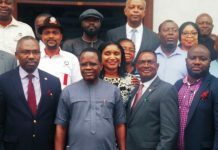 Meanwhile, stakeholders, non-governmental organizations have condemned the massive ballot box snatching, shooting and violence during last Saturday’s bye-election for Port Harcourt Constituency 111 Assembly seat. Sir Austin Opara, who is a former Deputy Speaker at the Federal House of Representatives and hails from the constituency, accused All Progressives Congress (APC) factional Chairman in Rivers State, Ojukaye Flag Amachree of using security operatives and thugs to cart any electoral materials. 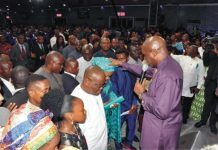 He said attempts to seek the attention of the Police failed as men of the Special Anti-Robbery Squad (SARS) were part of the machinery to disrupt the elections. On his part, Mayor of Port Harcourt Victor Ihunwo condemned the election over the violence that was witnessed across the wards and polling units. Ihunwo likened the election to a war situation, as he warned that if nothing is done to check the trend, it might pose treat to the nation’s democracy. In her reaction, prominent Niger delta activist, Ann Kio Briggs described the violence that marred the election as a deliberate intimidation of the electorate, by some desperate politicians. Kio-Briggs warned that such development was unpalatable and threat to the democratic process. President of Niger Delta Coalition (NDCAV) Christian Lekia said the violence was a dangerous signal ahead 2019 general elections. “It’s quite regrettable that Nigerians are mobilized to obtain their permanent voters card, but are denied the opportunity to exercise their civic reasonability during elections. What happened in PHALGA Constituency 111 is indeed a incentive to our democratic process”. Lekia cautioned politicians against the use of thuggery and violence to vying elections, as he urged them to respect the tenets of democracy. 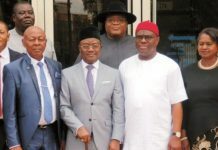 On his part, Director of National Orientation Agency (NOA) in Rivers State, Oliver Worlugbom said the widespread violence that marred the elections was an indication that politicians are yet to learn their lessons, and respect the rights of the electorate, to choose their political leaders through the ballot box. In the words of the NOA Director, “the process of election should not be seen as a do-or-die affairs”, adding that, “security operatives should not allow themselves to be used by politicians to derail the democratic process”. 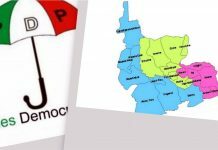 Following massive ballot box snatching, shooting and violence by the opposition during last Saturday’s bye-election for Port Harcourt constituency 111, Peoples Democratic Party (PDP) candidate in the election, Chiemeka Nmenikini has called for cancellation of the polls. Nenikini made the call shortly after hoodlums led by All Progressives Congress (APC) State factional Chairman, Ojukaye Flag-Amachree disrupted the elections, and carted away electoral materials at Ward 10, unit 7, 8 and 9 at Mile 3 Diobu. 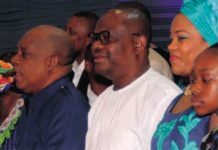 The PDP candidate accused both the Police and the Independent National electoral Commission (INEC) of compromise following widespread violence, and ballot box snatching witnessed during the polls. Nmerukini accused the Police, especially men of the Special Anti-Robbery Squad (SARS) of openly supporting the APC in unleashing terror on voters, and carting away of electoral materials across the constituency. “It’s very unfortunate that at this stage incur democracy that we are still thinking of snatching ballot boxes and all that “Nmerukini said, “even INEC has failed us because in most units the card reader did not work”. Similarly, Chairman of the State Chairman of Local Government Service Commission, Chief Azubuike Nmerukini has described last Saturday’s bye-election as a show of shame. Chief Nmerukini condemned the violence that characterized the elections, and said it was attempt to truncate the. In a related development, the State Chapter of the PDP has warned factional Chairman of the APC, Flag-Amachree to desist from displaying thuggery tendencies in democratic settings. The PDP in a statement on Saturday signed by its chairman, Bro. Felix Obuah said, … “elections can never be won by guns, bullets and physical brutality. Rather the people must be allowed to exerine their freedom of choice as to who represents them through the ballot box”. 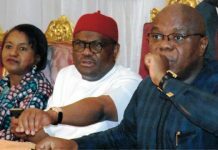 While condemning activities of the APC faction leader, who used bandits to cart away electoral materials, including result sheets, the PDP warned that it shall no longer tolerate wanton disruption of a democratic exercise, stressing that its display of maturity should not be misconstrued as a sign of weakness. “No person or group has monopoly of violence”, it added. Consequently, INEC has suspended the bye-election for Port Harcourt Constituency 111 Assembly seat, citing widespread violence that characterized the elections as responsible for the decision. 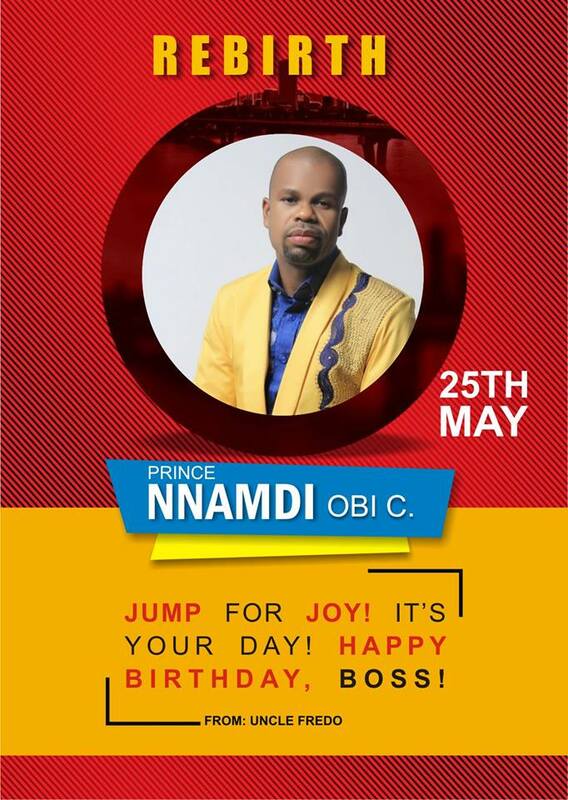 Resident Electoral Commissioner (REC) in Rivers State, Mr. Obo Effanga announced the suspension Saturday night.